"Official" Post Cards -- Cards issued by the CZ railroads. Vista Dome California Zephyr -- Caption on the back reads, "The new diesel-powered stainless steel CALIFORNIA ZEPHYR between Chicago, Denver, Salt Lake City and San Francisco features the unique VISTA-DOME cars. 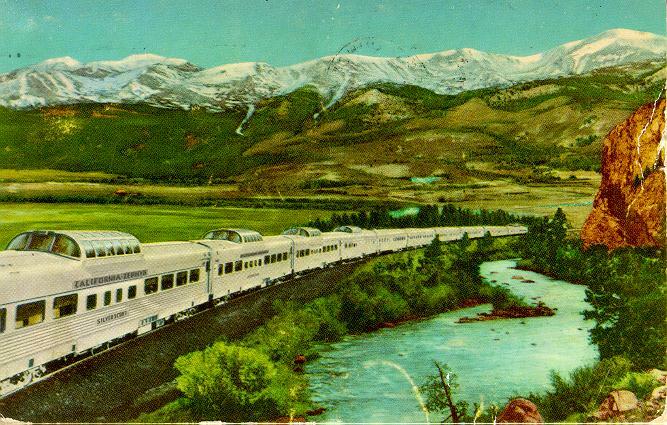 This train operates via the Burlington, Rio Grande, and Western Pacific railroads through the Colorado Rockies and Feather River Canyon....the Scenic Way Across America." 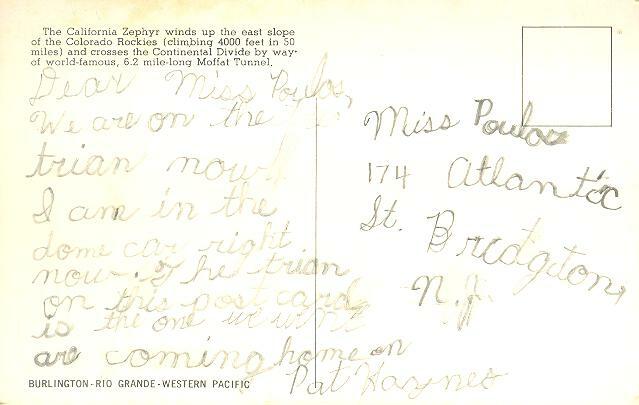 The postal message reads, "...if you can, come east be sure and travel on this Calif. Zephyr. I love it. The autumn colors in the Mts -- beautiful. Also can see snow. It's hard to write when train is going fast." Postmarked Suttons Bay Mich, Oct. 4, 1949. 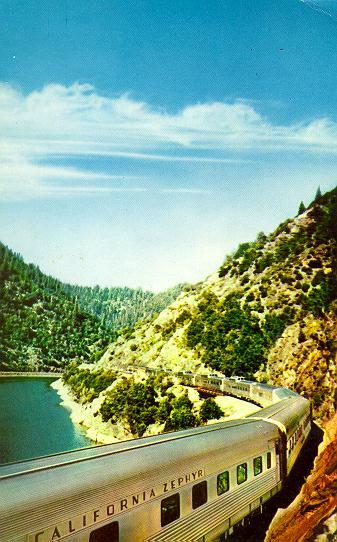 Feather River Canyon From a Dome -- Caption on the back reads, "The new diesel-powered stainless steel CALIFORNIA ZEPHYR between Chicago, Denver, Salt Lake City and San Francisco features the unique VISTA-DOME cars. 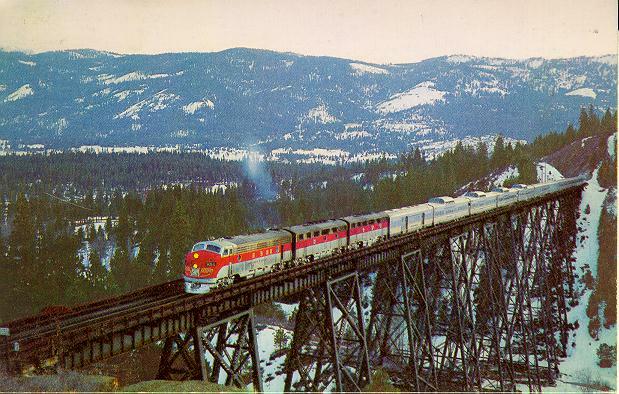 This train operates via the Burlington, Rio Grande, and Western Pacific railroads through the Colorado Rockies and Feather River Canyon....the Scenic Way Across America." Postal message reads, "Fri Oct 26, '51 its 5:45 pm. I've eaten a fish dinner. $1.28 & so good. We stopped at Galesburg. Soon we pass over the miss. Gee, I can't believe I'm on my way west. You should take a trip on this train." Note the artistic licence: The wires have been left off the slide fence pole, and the diesels are CB&Q silver! Postmarked Ottumwa Iowa, Oct. 28, 1951. 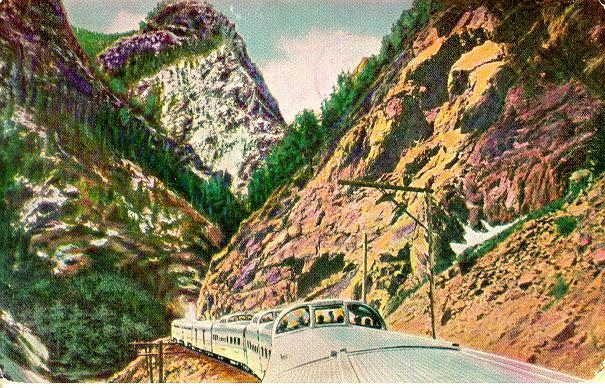 The California Zephyr Dome Cars -- This card, which appears to feature the Rockies, was published both as a general CZ card, as well as with the Rio Grande logo on the back. 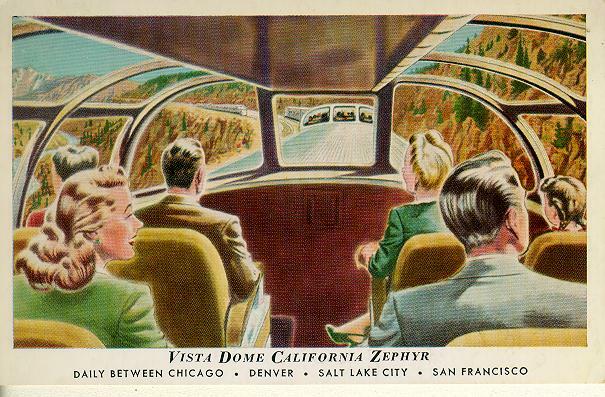 Both versions have the same caption, which reads: "The diesel-powered, stainless steel CALIFORNIA ZEPHYR, daily between Chicago, Denver, Salt Lake City and San Francisco, features five thrilling VISTA-DOME cars. 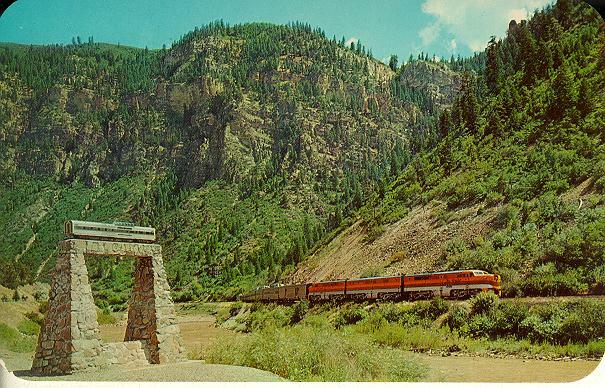 The train operates via the Burlington, Rio Grande, and Western Pacific railroads through the Colorado Rockies and Feather River Canyon...the Scenic Way Across America." The postal message reads: "This is the train I am now riding. Just left Salt Lake City, will travel all day tomorrow. Love, Ida." Postmarked Grand Junction CO, August 1, 1956. 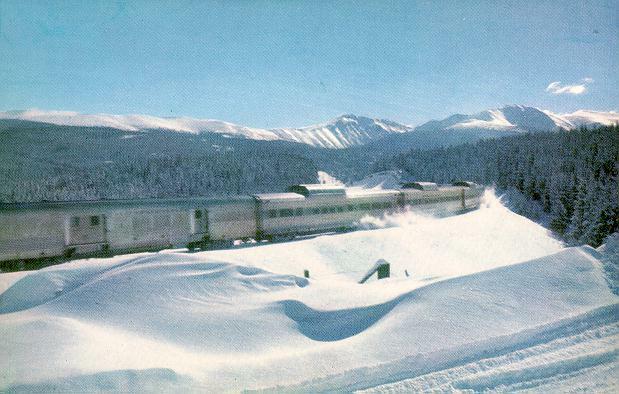 Spring at Winter Park -- Caption on back reads, "A trip aboard the luxurious Vista-Dome California Zephyr is filled with thrills as the train travels for hundreds of miles though the Alpine meadows and awesome canyons of the colorful Colorado Rockies during daylight hours. Burlington*Rio Grande*Western Pacific". View shown was a popular one in CZ advertising. Card is unused. 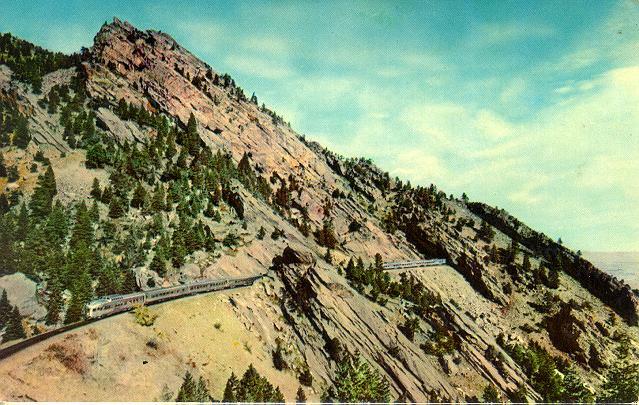 South Boulder Canyon -- Back reads, "The vista-Dome California Zephyr threads its way through South Boulder Canyon in the rugged Colorado Rockies...one of many scenic thrill on the Burlington-Rio Grande-Western Pacific transcontinental route." Card is unused. 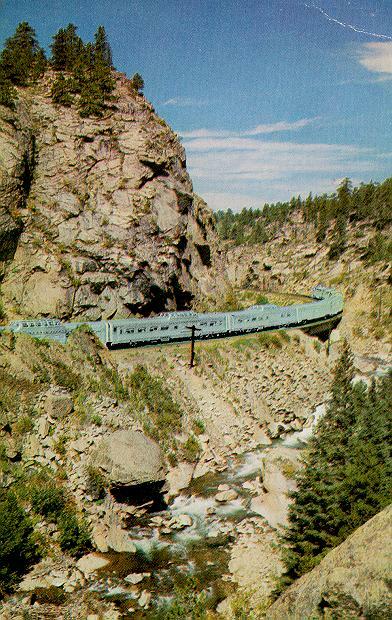 The CZ at Plainview, CO -- Back reads, "The California Zephyr winds up the east slope of the Colorado Rockies (climbing 4000 feet in 50 miles) and crosses the Continental Divide by way of world-famous, 6.2 mile-long Moffat Tunnel. Burlington*Rio Grande*Western Pacific." The message on the back is a cute one from a young child in the dome car, probably to his teacher. 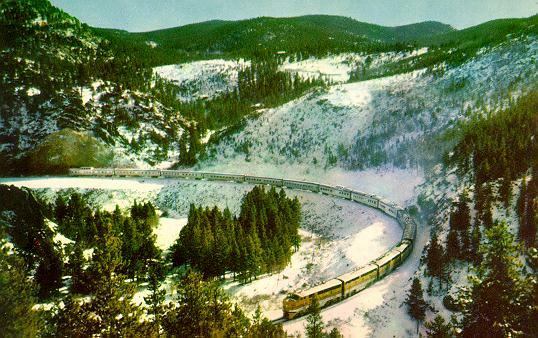 Pine Cliff, Colorado -- Back reads, "A trip aboard the luxurious Vista-Dome California Zephyr during the winter months is filled with thrills, as the train travels for hundreds of miles through the very heart of the mighty Colorado Rockies during daylight hours. Burlington*Rio Grande*Western Pacific". No postmark. CZ in the Winter Rockies -- Back reads, "Winter-time travel on the Vista-Dome California Zephyr is replete with thrills, as the train crosses the majestic Colorado Rockies during daylight hours. Burlington*Rio Grande*Western Pacific". No postmark. Rounding a Curve in the Feather River Canyon -- Back says, "The California Zephyr winds through California's famed Feather River Canyon for over 100 unforgettable miles. Upstairs in the streamliner's five Vista-Domes passengers can look up, look down, look all around at the magnificent scenery. Burlington*Rio Grande*Western Pacific." 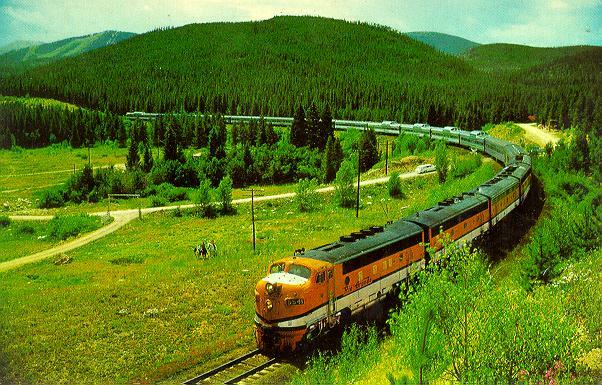 From the postal message: "We are enjoying our ride on this train, had a good trip back on the Santa Fe...." Postmarked Denver CO, September 8, 1965. 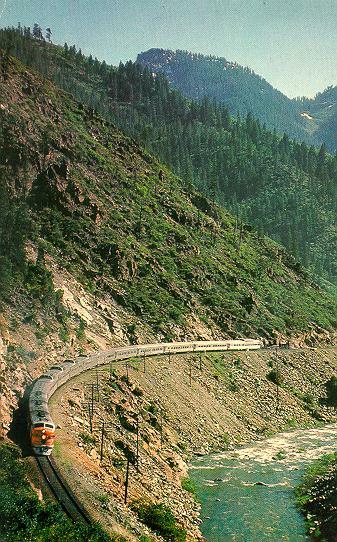 California Zephyr Hugs the Cliffs of the FRC -- This picture is very similar to one the appeared on the October 1967 WP/CZ timetable. Back caption reads the same as the card above. Postmarked Erie PA, June 22, 1964. California Zephyr Crosses the Clio Viaduct -- Back caption reads, "The Vista-Dome California Zephyr crosses the Sierra Nevada range near the headwaters of the fabulous Feather River, on its thrill-filled 2500-mile Chicago-San Francisco journey. 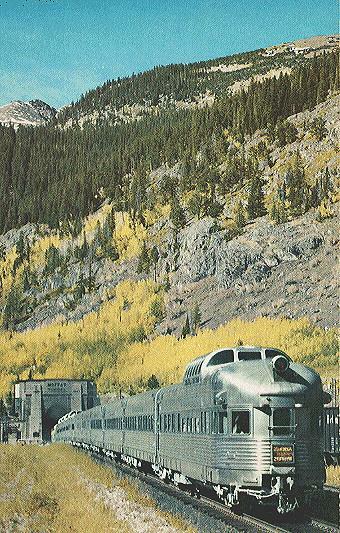 Burlington*Rio Grande*Western Pacific" No postmark. Aftermarket Post Cards -- Cards relating to the CZ, but issued by other publishers. Exposition Flyer at the Tobin Bridges -- For a few months before the 1949 inauguration of the CZ, the WP operated its newly delivered equipment -- both cars and locomotives -- on the Exposition Flyer, the train that the CZ would replace. 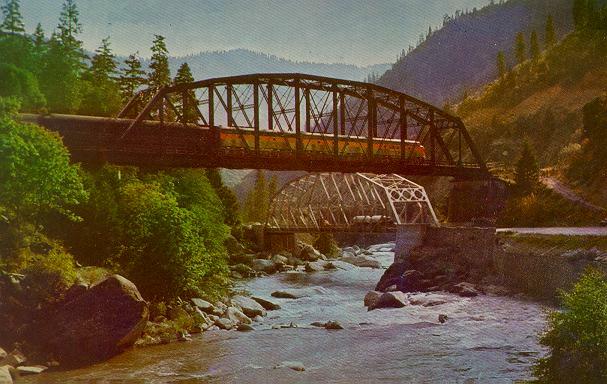 The back caption reads: "Streamliner on Western Pacific Railroad crosses Feather River on high bridge as highway traffic travels on the lower bridge in this rugged canyon." Published by Mike Roberts Color Productions. 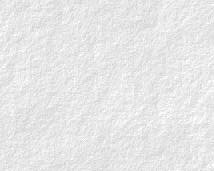 No post mark. Vista Dome Monument -- Caption on back reads, "#3774 -- D&RGW Railroad monument in Glenwood Canyon on U.S. 24 in western Colorado. The monument marks the locality where the idea of Vista Dome cars was first born in 1944. Color by D&RGWRR". At bottom, "Published by Sanborn Sourvenir Co. Inc., Denver Colo.," and vertically "Genuine natural Color Made by DEXTER PRESS Inc., West Nyack NY." Card is unused. 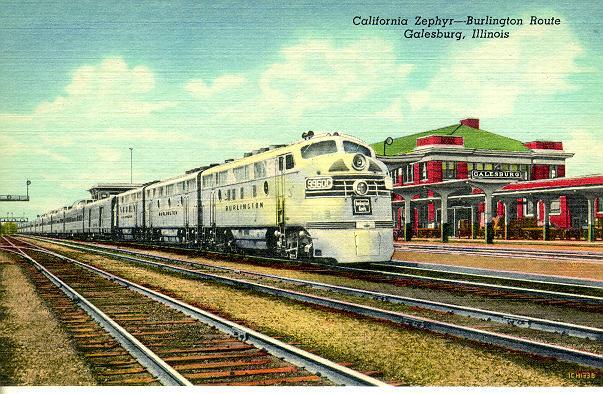 California Zephyr, Burlington Route, Galesburg Illinois -- No back caption, "Genuine curteich CT Art-Colortone, distributed by Illinois Camera Shop, Galesburg, Ill. No postmark.